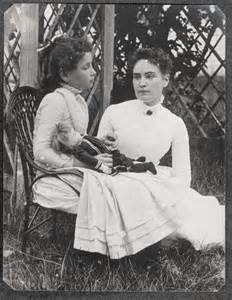 Helen Keller and her teacher, Annie Sullivan. 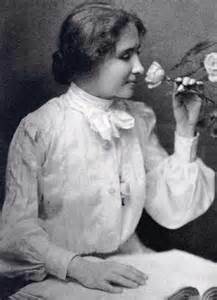 Though most viewers consider The Miracle Worker to be about Helen Keller, William Gibson wrote the play as a tribute to her teacher, Annie Sullivan, and to her struggles in helping Helen understand language. Annie’s relationship with Helen is displayed in a dramatic, but honest way. Her struggles with Helen have been viewed as physically intense, yet comical and loving. Gibson uses various methods to create and develop the relationship between Annie and Helen. Here are some the methods the playwright uses to make the characters come to life and interact in an engaging and enlightening manner. Shortly after Annie arrives to the Keller household, the significance of language is first emphasized. Annie informs Kate that her goal is to teach Helen “first, last, and—in between language…Language is to the mind more than light is to the eye. “ Annie can genuinely relate to Helen, as she was once blind herself, and has felt the rewards of learning language. 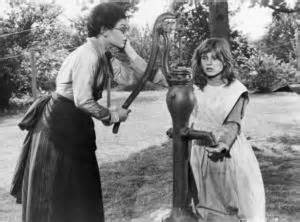 Despite this potential bond, Annie feels doubtful that it is possible to teach Helen language and meaning. Repetition was key in learning. 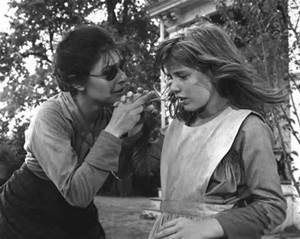 In the beginning of The Miracle Worker, Helen is extremely willful. Her family has never challenged her. Annie realizes she must first figure out how to control her behavior and teach Helen self-restraint. After she sees progress in this area, she begins to teach Helen hand symbols for various objects. 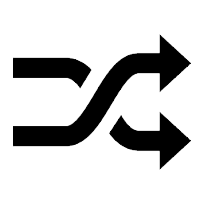 At first, Helen views the hand symbols as merely a repetition game, and she fails to connect the symbols to the objects. Although Annie is hopeful that this repetition will work eventually, her doubts are so overwhelming that she asks the Kellers for complete control over Helen. They are skeptical and concerned about entrusting Helen to somebody else, but Annie feels that it is necessary for Helen’s progress. She believes that Helen will fall back into old habits when she is under the care of her parents. Once Helen’s parents give Annie this control, the teacher uses every method to keep Helen motivated, including repetition, force, and even resentment. One might watch the play and think, “Wow, she is tough with Helen!” But keeping in mind Annie’s past and understanding her goals with Helen, a hint of hope can be seen as she works in an uncompromising manner with Helen. Annie does not give up. Annie struggles with a great amount of self-doubt and a lack of confidence due to tragic events that have occurred in her past. 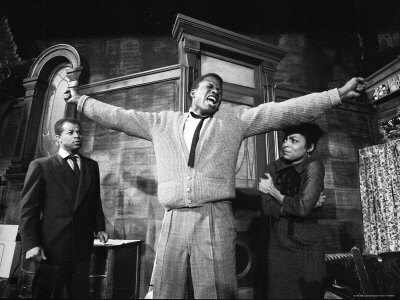 Throughout the play, she is haunted by Offstage Voices, which represent her own conscience. The most powerful voice of all is that of her younger brother, Jimmie, whose death Annie blames on herself. She had once promised Jimmie that she would love him “forever and ever,” and because she feels as if she had failed him, she is afraid that the same will happen with Helen. Fortunately, these voices motivate Annie to prove herself, and she is all the more determined to succeed. Henceforth, she develops a “take charge” attitude that comes across as brash, and although this causes the Kellers to resist her control, Annie is stubborn and she is able to convince the Kellers to give her a chance. They have pitied Helen her entire life, and although Annie is rather harsh and strict with Helen, it is out of love, and it is what Helen needs. At the end of the play, after the “miracle,” Annie holds Helen and outwardly promises to love her “forever and ever,” just as she had promised Jimmy. ← The Major Theatrical Unions in the U.S.